ESPN.com: Page 2 : Where are they now? 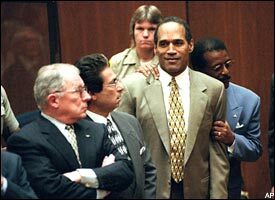 F. Lee Bailey, Robert Kardashian and Johnnie Cochran surround O.J. Known for defending high-profile figures such as Patricia Hearst and the Boston Strangler, Francis Lee Bailey added to his list when he joined the defense team for the Simpson trial. Famous for his brilliant questioning of Los Angeles detective Mark Fuhrman in the O.J. case, Bailey has seen legal trouble of his own since then. The Massachusetts native served six months in jail for contempt in 1996 and was disbarred in Florida and Massachusetts in 2001 for mishandling $21 million in stocks owned by former client and convicted drug dealer Claude DuBoc. Bailey recently sold his waterfront home in the Point Manalapan section of Palm Beach, Fla., for $2.2 million. If he chooses to continue practicing law, Bailey can apply to have his license reinstated in 2006. He currently resides in Prescott, Mass., and is a frequent guest expert on television shows such as "Larry King Live", "Today", and "Good Morning America". The sister of murder victim Nicole Brown, Denise Brown recently came out with remarks blaming the trial's prosecutor, Marcia Clark, for being insensitive and botching the criminal trial. Denise, who labeled the case a "huge circus," runs the Nicole Brown Charitable Foundation, a nonprofit group that seeks to educate the public about family and partner violence. O.J. claims Denise profited from Nicole's murder. The two have not seen each other or spoken since the custody trial concluded in 1997. Denise is planning to launch a one-hour reality-based TV series called "Predator", which will use hidden cameras to expose real-life stalkers. "Know them ... before they know you," the show claims. Losing what is labeled "the case of the century," co-prosecutor Marcia Clark left the L.A. County district attorney's office following the Simpson trial. Denise Brown, sister of murder victim Nicole Brown, recently blamed Clark for blowing the case. Clark no longer practices law, but has been on television as a legal analyst on the Michael Jackson case for "Entertainment Tonight". Clark's 480-page book "Without a Doubt", which hit shelves in 1997, earned her $4.2 million. Defense "Dream Team" member Johnnie Cochran helped acquit O.J., but was accused by Robert Shapiro, who brought Cochran onto the team, of overusing the race factor. Following the trial, Cochran banked $2.5 million for his autobiography "Journey for Justice," and also co-anchored a short-lived program entitled "Cochran & Grace" on Court TV. Cochran recently lost a case in which he represented the family of the Winnie the Pooh merchandiser in a royalties war against Walt Disney Co. This past March, he was hired for the third time by Linda Will, the mother of former Northwestern football player Rashidi Wheeler, who died during a preseason practice in 2001. (Will has fired Cochran twice during the case.) Cochran was released from a hospital last month after being treated for a neurological condition. The condition is not life-threatening, and Cochran is expected to make a full recovery. His family has requested that his condition remain private. Cossack's career was also boosted by CNN's coverage of the Simpson trial. While practicing law in Los Angeles, Cossack was contacted by CNN for legal input on the case. He ended up taking a job with the network and worked there from 1994-2002. Cossack co-hosted CNN's successful show, "Burden of Proof", and followed it by hosting Court TV's "Open Court". Cossack is currently the legal analyst for ESPN and has been the Worldwide Leader's prominent face during its coverage of the Kobe Bryant trial. Al Cowlings played for the Buffalo Bills for three years in the early '70s and was voted as one of the team's worst first-round picks by the Buffalo News. But he is better known for his famous role in driving Simpson in the white Ford Bronco during a slow-speed pursuit in the week after the murders. According to Simpson, the two were not trying to flee, and Cowlings called police to inform them where to get O.J. The boyhood friend of Simpson's reportedly was working as a handbag sales representative, but is now bankrupt and living in Los Angeles. 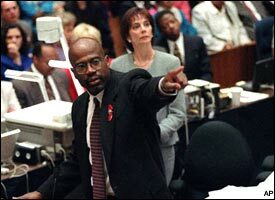 Christopher Darden prosecuting the case, with Marcia Clark in the background. Like his fellow co-prosecutor Marcia Clark, Christopher Darden quit the Los Angeles County district attorney's office following the trial and went into private practice. Darden made a reported $1.3 million for his book "In Contempt", which he dedicated to murder victims Nicole Brown and Ronald Goldman. Darden, who has also written a handful of fictional legal thrillers, appears as a legal commentator for celebrity trials on CNN. In 1997, he married entertainment executive Marcia Carter. The couple has a son, Christopher, and Darden also fathered another child, Tiffany, by another woman in 1997. Detective Mark Fuhrman left the LAPD after being convicted of perjury for denying he had used racial slurs during an interview. Famous for finding the bloody glove (although the defense accused him of planting it), Fuhrman moved to Idaho and became a TV crime pundit and author following the trial. His books include: "Murder in Greenwich: Who Killed Martha Moxley? ", "Murder in Spokane", and "Murder in Brentwood". Fuhrman was given credit for reviving the Moxley investigation, which eventually led to the conviction of Michael Skakel. The father of murder victim Ronald Goldman, Goldman and his wife, Patti, moved to Scottsdale, Arizona, following the civil trial. Simpson lost the civil trial and owes the Goldmans millions, but they don't expect to see his money anytime soon. Goldman hosted a radio show and worked part-time in the Arizona attorney general's office as a victims' rights advocate, and is now reportedly working in clothing retail. Goldman recently criticized Judge Lance Ito for turning the criminal trial into a circus. His daughter, Kim, gave birth to a baby boy last September. The infamous judge in the Simpson case, Ito continues to preside over lower-profile criminal cases in the same courtroom in downtown Los Angeles. Ito, who has yet to grant an interview regarding the Simpson trial, sold his five-bedroom home in Pasadena for $1.7 million. He and his wife, Peggy York -- a retired LAPD captain -- purchased a larger home in the same neighborhood. Ito was blamed by Fred Goldman -- father of murder victim Ronald Goldman -- for turning the trial into a circus. The long-haired house guest of the Simpsons, Kaelin was a spacey witness during the trial. Kaelin tried to use the notoriety he gained during the trial to launch an acting career, but never made it big. He attempted a talk show, which bombed; and he has acted in 14 B-list movies and been a Playgirl cover boy. Kaelin made a handful of TV and radio appearances, and is occasionally seen at B-list Hollywood events. One of Simpson's friends as well as part of his legal team, Robert Kardashian died in October of 2003 eight weeks after he learned he had cancer of the esophagus. 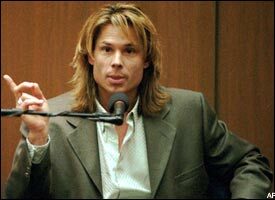 Simpson stayed at Kardashian's home in the days following the murders of Nicole Brown and Ronald Goldman. The infamous white Bronco chase began at Kardashian's house. After working as a defense attorney on the Simpson case, Shapiro criticized fellow "Dream Team" member Johnnie Cochran for playing the race card. Among others, Shapiro has since represented actor Robert Downey Jr., and record producer Phil Spector, whom he no longer represents. Shapiro was paid a reported $1.5 million for the book "The Search for Justice". He also wrote the legal thriller, "Misconception". Due to trial-related clashes, Shapiro severed his longtime friendship with "Dream Team" member F. Lee Bailey. Justin, who will turn 16 this summer, attends Gulliver Academy, a prestigious Florida school with a tuition of $17,000 per year, and plays lacrosse, basketball and football. Named the school's top athlete, the 6-foot-1, 189-pound, soon-to-be 10th grader plays running back for the football team, like his father did. O.J. has called his son "the finest kid he's ever known." He also said in a recent interview that he's never spoken to his children about what happened to their mother. The Heisman Trophy winner was acquitted of the murder of Nicole Brown and Ronald Goldman in the criminal case, but a civil jury held him liable for the deaths in 1997. Simpson was asked to pay $33.5 million to the Goldman and Brown families; however, he said in a recent "Dateline" interview that he doesn't plan to pay the money. Simpson moved to Florida in 2000 and spends his time with his kids and on the golf course. Simpson does not work and claims he goes to bed at around 8:30 p.m. every night. He says he does not have the proper funds to hire someone to search for the "real killer." Now 18, the daughter of O.J. and Nicole graduated this year from Gulliver Academy. Sydney, a star volleyball player, wants to become a child psychologist and will attend a college in the northeast, O.J. told NBC's Katie Couric. Sydney reportedly dialed 911 during a family dispute in January of 2003, complaining about her father. "He tells me he doesn't f-ing love me," Sydney said to police. "That's not, like, an abuse thing?" Van Susteren joined CNN in 1991 as a legal analyst, and became famous for her analysis of the Simpson trial. She also served as host of CNN's prime-time news and analysis show, "The Point with Greta Van Susteren", and she co-hosted "Burden of Proof", CNN's daily legal program. Currently, Van Susteren, who joined the Fox News Channel in January of 2002, hosts the prime-time news and interview program, "On the Record with Greta Van Susteren", which began in Feb. 2002 and is the top-rated news talk show in its specific time slot. Al Cowlings' white Ford Bronco became famous the day he drove O.J. Simpson, who held a gun to his head in the back of the Bronco, down the freeway at slow speed with police in pursuit. Following the civil trial, a collector named Michael Pulwer purchased the vehicle for $75,000, nearly twice its original value. Cossack: The importance of O.J.